Good nutrition for a pregnant dog ideally starts before breeding. Then, it continues through both pregnancy and nursing. Pregnancy lasts about 63 days for most dogs. You won't have to increase how much she eats right away though. Less than 30 percent of fetal growth happens during the first five to six weeks. It’s a common mistake to increase food and calories too soon, but not enough during nursing. You might not need to immediately change to a new food either, if she’s already eating something high quality. If meat and protein isn’t already the center of her diet though, you should definitely look for something better. After six weeks, gradually give her 30 to 50 percent more calories. Her weight needs to increase by 15 to 30 percent, before she gives birth. That might mean more frequent meals and/or free-feeding, especially if her appetite decreases as she becomes less comfortable. You obviously need the best dog food for a pregnant dog to support her and her growing puppies. Something you might not have considered though is moisture. Dogs only fed dry food often don’t get enough. That mild dehydration is hard on their organs, especially the kidneys, but pregnancy multiplies the problem. A high-quality canned dog food for a pregnant dog is essential, such as Wild Calling Canned Dog Food. In the wild, dogs get their protein from many different sources. The best diet for your pregnant dog needs to reflect that and use rotation to make sure the mother and her babies get all ten of the essential amino acids they need. 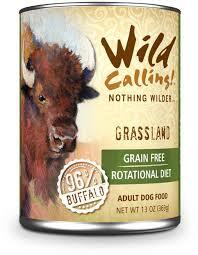 Wild Calling’s recipes start with 96 percent meat, fish or poultry. They don’t use grain, gluten or artificial ingredients either. That’s why Pet Product News International gave them their 2014 Editor’s Choice for best dog food. Many experts agree, the best dog food for pregnant dogs also needs to be a good source of fatty acids, like EPA and DHA. Some dog foods fortify their recipe. If you really want to improve the neurologic development of your puppies though, I wouldn’t settle for a bit of fish oil. They’ll always be better absorbed when bound to fish protein, as nature intended. That's also why Orijen only uses non-rendered fats. Fish is a great source of glucosamine and chondroitin too. 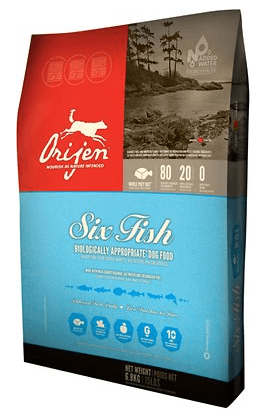 Orijen 6 Fish Grain-Free Formula Dry Dog Food uses six fresh and salt-water fish caught in Canadian lakes and coastal waters, with sustainable fishing practices. In fact, regional ingredients are Origen's speciality. The raised or wild fish arrives fit for human consumption too. This recipe is 80 percent fish, which supports lean muscles. It will make your pregnant dog glow with the benefits to her skin and fur. Because it’s low in carbohydrates, there’s a low-glycemic index, which is just what a pregnant dog needs to keep her blood sugar even. It’s not just grain-free; there aren’t even any potatoes or tapioca. The calories are 40 percent from protein, and 38 percent from fish oils. Only 22 percent of the calories come from fruit and vegetables. A good food for pregnant dogs has to be good for her puppies too, especially if she’s nursing 8 to 12 of them, or maybe even more! She needs 25 percent more calories for each puppy, up to about a 200 percent increase. If she has 10 or 12, it can be really hard to make sure she’s getting everything she needs, so you have to maximize calories and nutrition for every mouthful. Our dogs are actually at their greatest risk of nutritional deficiencies during the first four weeks of nursing. That’s why most vets recommend changing to a high quality puppy food or an active dog food. They’ll also have the right ratio of protein and fat. 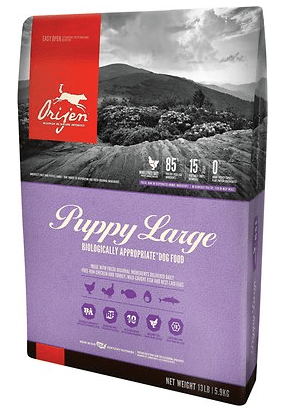 Orijen Puppy Large Breed Grain-Free Dry Dog Food is best puppy food for pregnant dogs because it's rich in calories and minerals. It’s 80 percent meat from cage-free chickens and turkeys, as well as fish. It also has a low-glycemic index, without a lot of carbohydrates like rice, corn, potato or tapioca. The kibble size might be more appealing to your dog too. If you have a small breed dog, however, you might want to try their other puppy formula. The calories in this recipe are 40 percent from protein, and 38 percent from fat, leaving only 22 percent to come from fruits and vegetables. That’s a similar ratio to what wild dogs eat. Limited, high-quality ingredients are sometimes best for sensitive dogs or those with allergies, but protein is always the center of the best food for pregnant dogs. High performance formulas like Pinnacle Grain-Free Peak Protein Recipe Dry Dog Food are another great option for nursing dogs or for later on in the pregnancy. Of all the dog foods on our list, this one is the highest in crude protein at 42 percent and crude fat at 22 percent. Like the others, it’s very natural and low in carbohydrates, although there is some potato in this recipe, which is a simple starch. Pinnacle still considers this formula grain-free as well, although it has alfalfa meal and organic quinoa seed, known for its low glycemic index and nine essential amino acids for muscle development. Chicken meal and whole chicken is where most of the protein comes from, but there’s also chicken fat, eggs and salmon oil to provide the omega 6 and 3 fatty acids that we’re looking for. Dog foods like this are designed for sustained activity and endurance with lots of fresh meat, protein and fat. 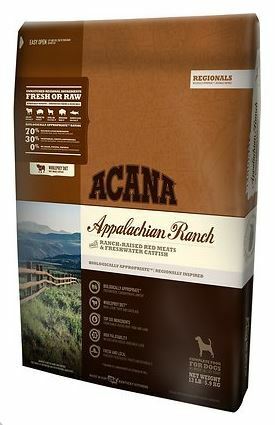 This formula is 75 percent meat, from free-run chickens and wild arrowtooth, using ACANA’s Biologically Appropriate™ ratios of meat, organs and cartilage. Since it’s similar to the WholePrey™ dogs eat in the wild, it’s easy for them to absorb all of the essential nutrients. The recipe doesn't need a lot of synthetic additives either. Livers, kidneys and tripe provide natural vitamins and minerals. Bones and cartilage add calcium and phosphorus, so the only supplement the food needs is zinc. One third of the meat is fresh, and the rest is dried for concentrated protein. The fruit and vegetables are locally sourced, like pumpkin and butternut squash. They have a low glycemic index too, without rice, tapioca or potato. The formula is grain free, and there are no plant protein concentrates. Only 25 percent of the calories in the dry food come from carbohydrates. Veterinary nutritionists connect malnourishment before breeding and during pregnancy to puppy mortality. It's common to lose between 20 and 30 percent of puppies. If she doesn't have enough fuel, including protein, vitamins, minerals and energy, the pregnant or nursing dog will rob her own body of nutritional reserves. That hurts not only her puppy's health, but her own. Being either over or underweight can cause birth defects. The mother can have problems carrying her whole litter to term or during labor and nursing. It affects the immune systems of both the mother and her babies too. Sometimes, it's hard to see that the mother is actually too skinny until after she's given birth. Her puppies might be weak when with bad coordination and poor appetites, dying soon after. Even if you do better next time, the issue can continue into the next pregnancy, or she could have trouble conceiving again. If you aren't sure she's getting everything she needs, it's important to take her to the veterinarian as soon as possible. Best Dog Food For Arthritis – Top Picks & Comparisons! Best Dog Food for Diabetic Dog: Reviews & Top Picks! Best Dog Food For Urinary Health: Reviews & Top Picks! It is so much important to collecting the best food for a pregnant dog. Actually, I have a dog which is pregnant. And then I’m looking for the best food name for a pregnant dog. Here I got lots of thing about this. Thanks for sharing this great info.